St Mungo’s Parish Church in Cumbernauld is celebrating 50 years of the opening of its church building to the very day this Sunday 4th September. There will be a service celebrating the sacrament of Holy Communion at 11.15 am followed by a afternoon tea in the large hall. There will also be a chance to reminisce with some old photos of the Church through the 50 years to the present day. A warm welcome is offered to all. “Happy Birthday to you, Happy Birthday to you, Happy Birthday dear Church, Happy Birthday to you”. We all have birthdays, and the Christian Church is no different. Did you know the Church had a birthday? When Jesus had been resurrected, he said he would send a helper – the Holy Spirit – to help the disciples in the work he’d asked them to do. Jesus went back to Heaven but as he did so, the Holy Spirit came down onto the disciples like flames of fire; like a strong wind. They then carried on the work that Jesus had asked them to do. This month in J.A.F.A. Church we’re holding a birthday party! We’ll be making candles with flames, birthday cards, paper chains for our party and we’re even going to have a birthday cake! Come along from 4 – 6pm on Sunday 29th May to Abronhill Parish Church. It’s free and you don’t even have to bring a present! Jesus is your present! Sunday 11th October: Plaza Praise in the Precinct outside the Church at 6.30pm (weather permitting) followed by refreshments in the church hall. Come and sing hymns from 1965 to the present date. Monday 12th to Friday 16th: Children’s Morning Holiday Club from 10am – 12 noon. This is aimed at the Primary School age-group and parents are asked to register their children with the Family Worker, Susan Boland at the church. Each day, while the Holiday Club is on there will be a ‘drop in’ Prayer Group for the Holiday Club. This will be preceded by a meal at 6.00pm for which, also, there will be no charge. J.A.F.A Church will also be on that Sunday, between 4 and 6pm. We’ll post details of that separately nearer the time. The Church building and Sanctuary will be open for the full two weeks between Sundays 11th and 25th October with memorabilia displays showing the church history and for a quiet time of prayer and reflection. We hope you will join us to celebrate our Golden Anniversary – you will be made most welcome! Catriona Ogilvie, the minister of Cumbernauld Old Parish Church, will soon be retiring, having served the congregation faithfully for the past sixteen and a half years. Her final worship service will be this coming Sunday 20th September. The service at 11.00am in the Parish Church in Cumbernauld Village will be followed by a buffet lunch in the Forge Centre, Balloch from around 1.00pm. Please join us to pass on your best wishes and say goodbye. Woohoo!! I hope everyone has had a great time over the summer holidays and that you are now looking forward to coming back to Messy Church. I know we are! Our next Points North Messy Church will be on Sunday 13th September from 3.00-5.00pm, but please note we’ve moved: our new location will be the Condorrat Parish Church hall. There is parking available and if anyone needs transport feel free to leave a message and we can organise for you to be collected… we don’t want anyone to miss out! Everyone is welcome to join us and if you can lend a hand even better… the more the merrier. 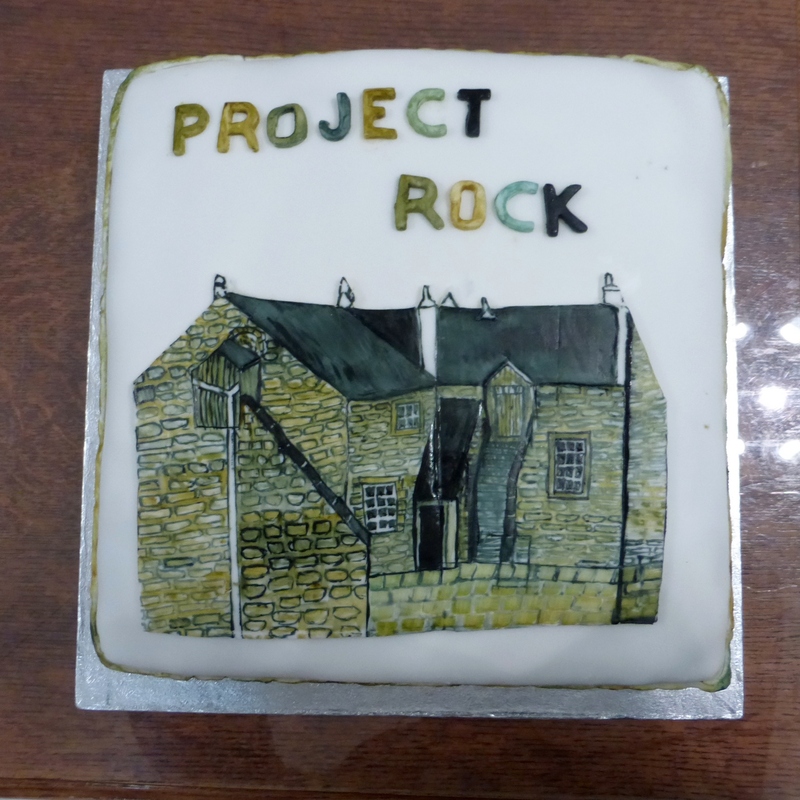 A packed church, joyful worship, a reflective sermon and delicious cake – that was the story at Cumbernauld Old Parish Church on Sunday evening. Members of our sister churches and the wider community joined us to give thanks to God and recognise the time, talents and money of those who participated in the eleven-year project to renew our church roof and the subsequent refurbishment of our worship sanctuary – what we called Project ROCK (Restoration of Old Cumbernauld Kirk). 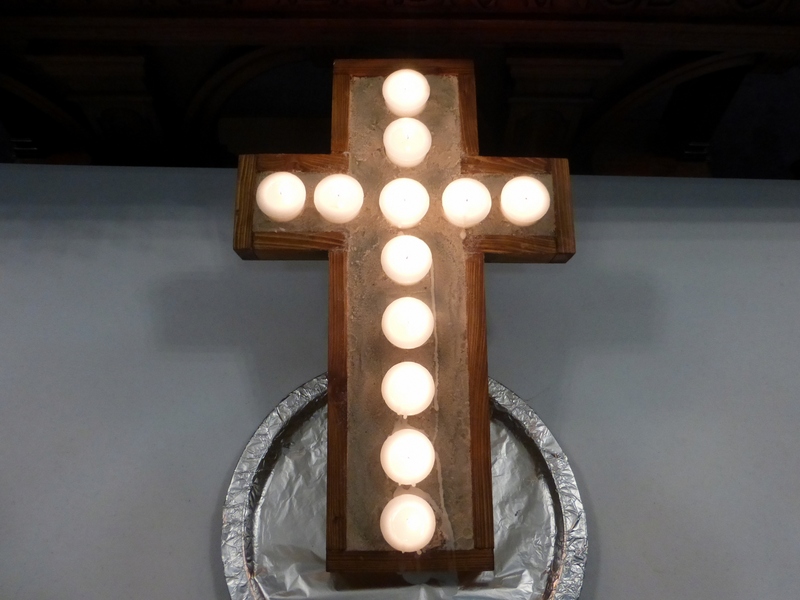 Representatives of some of the people and groups involved in the project led readings, meditations and prayers (including the lighting of a candle cross, pictured above) and the sermon was preached by Very Rev David Lunan, a former Moderator of the General Assembly of the Church of Scotland. Afterwards, it was good to see so many people stay on for a chat, a cup of tea and to sample the amazing baking on offer, including a cake specially designed for the occasion. All-in-all it was a fitting celebration of what has been a long, involved and sometimes difficult process. Finally, we ought to say “thanks” to Historic Scotland and the Heritage Lottery Fund for the grant funding that enabled us to complete this major piece of work on our Church building. 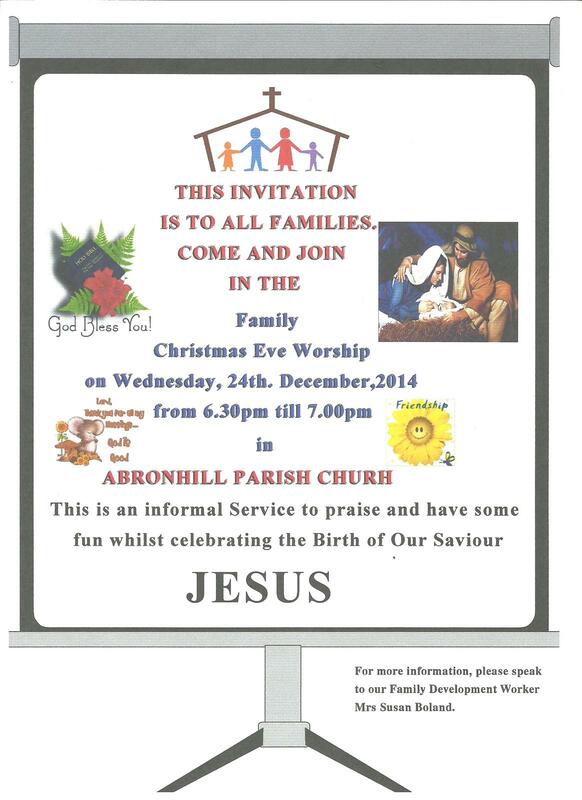 An invitation is extended to all for the Christmas Eve service at Abronhill Parish Church. The short service of celebration starts at 6.30pm and we’re telling the Nativity story using brands of chocolate so we need as many volunteers as possible to help. The service is open to all whether you have children or not as CHRISTmas is open to all – it’s not exclusive to the young. It will be noisy and fun so come along and join in. Look forward to seeing you there!